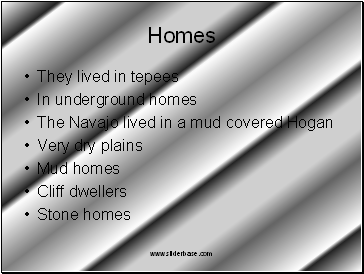 Hopi: Pueblo houses, farmed, stored food. Apache: fighters, hunted, gathered food, stole from Pueblo, made permanent houses. Navajo: fighters, Hunted, gathered food, stole from Pueblo, mud covered log Hogan. 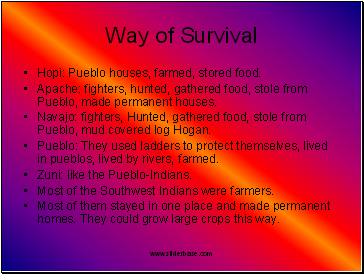 Pueblo: They used ladders to protect themselves, lived in pueblos, lived by rivers, farmed. Most of the Southwest Indians were farmers. Most of them stayed in one place and made permanent homes. They could grow large crops this way. 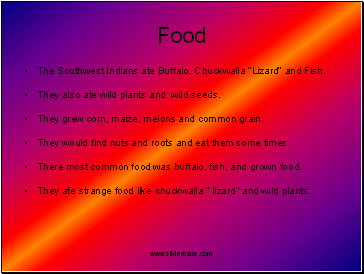 The Southwest Indians ate Buffalo, Chuckwalla “Lizard” and Fish. They also ate wild plants and wild seeds. They grew corn, maize, melons and common grain. They would find nuts and roots and eat them some times. There most common food was buffalo, fish, and grown food. They ate strange food like chuckwalla “ lizard” and wild plants. 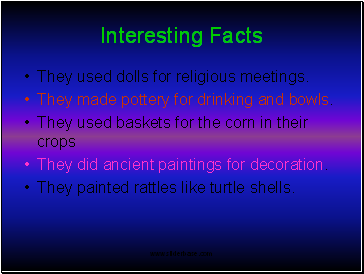 They used dolls for religious meetings. They made pottery for drinking and bowls. They did ancient paintings for decoration. They painted rattles like turtle shells.